I started my Taekwon-Do training in September of 1979 in a small function room in the town of Greystones located approximately six miles from my home town. As over forty people attended to try out this new martial art, we were split into two groups and took turns on the floor. It was obvious many people wanted to experience Taekwon-Do as it had not been seen in our area before. I had no previous knowledge of Taekwon-Do, nor indeed any other martial art and was very curious as to what it would be like. I had tried one Karate class several months earlier but found it was not to my liking. Indeed, this was my first time to stand close to someone who wore a Black Belt around their waist and the occasion was made even more intriguing when I recognised one of the Instructors as my cousin, Robert Wheatley. The Greystones School of Taekwon-Do was soon established and regular training began at the St. Kilian hall. We attended class diligently and prepared for our first Kup testing with Master Ki Ha Rhee as Examiner. Thirty nine students from the Greystones School undertook their test and all were successful. The next time I was graded by Master Ki Ha Rhee was in 1983 at the Taekwon-Do center in Dublin. I was, along with several other from our school, testing for my first degree Black Belt. Thankfully Master Rhee was satisfied by our performance and we were promoted to the rank of 1st degree Black Belts. During the following years, Master Robert Wheatley traveled to America several times where eventually he decided to emigrate and our school was left in the charge of his associate and fellow Instructor, Mr Jim Doyle. Several months later Mr Doyle informed us he was no longer able to teach at our school and suggested to four of the Black Belts, including me, to take charge of the school and continue with our training. During the following years, there was transition within Taekwon-Do in Ireland where additional associations were formed and the AITA (All Ireland Taekwon-Do Association), began. Our school was, by default, a member. I continued with my training and after several years became the principal Instructor at our Taekwon-Do school. The other Black Belts took different paths in their lives and I was fortunate that my path allowed my continued involvement with Taekwon-Do. I attended an IIC, International Instructors Course, during 1992 in Dublin. This was a five day course led by our founder, General Choi Hong Hi. It was here I first met General Choi and was inspired by his passion and knowledge. I could hardly believe I was being taught by the founder of Taekwon-Do. Some of us had trained for years and had never even seen General Choi. At that time it was the highlight of my Taekwon-Do involvement. Over the next seven years it was my good fortune to be in attendance at several other IICs led by General Choi. I was also able to play host as association President to General Choi, Master Choi Jung Hwa and Master Mc Callum in 1999 when our association hosted an IIC in Dublin. 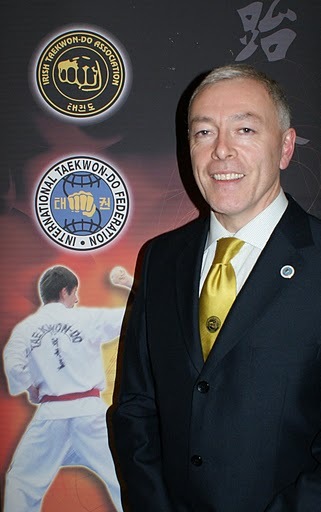 Following the great loss of General Choi in 2002, there was much turmoil in our Taekwon-Do world, even in Ireland. Many among us sought to move their allegiance from our ITF to elsewhere. Outside influences tried to lead us to other ITF groups; however, as President of our group I urged a time of calm and we held fast with our ITF. My patience and non-volatile actions were rewarded a hundred times over when, in March of 2003, I traveled to Scotland to attend an IIC being held by the new Technical Committee of the ITF and Master Trân Triêu Quân VIII degree and President of the ITF. I had traveled from Ireland with an anxious heart as this was my first time to experience the leadership and knowledge of the new ITF Technical Committee. My apprehensions were quickly dispersed when Master Hector Marano VIII degree, Master Pablo Trajtenberg VIII degree and Master Wim Boss VIII degree displayed infallible technique and knowledge of all aspects of our beloved Taekwon-Do. This was also my first time to meet Master Trân Triêu Quân, our President and the new leader of our ITF. I was inspired as I listened to his teaching on the Do of Taekwon-Do. Before this time I had no real understanding of the moral culture in our Taekwon-Do. Having listened to Master Trân, I felt a whole new aspect of Taekwon-Do lay before me to be learned and understood. It was at the IIC in Scotland that I tested for VI degree Black Belt. Fortunately, the Examiners found my performance to be acceptable and promoted me accordingly. It was not my promotion, however, which brought such overwhelming joy on my return to Ireland. I had experienced the new technical leadership of the ITF and listened to our new President. I was very happy I had made the correct decisions as to which ITF we should have loyalty with, both for myself and the association to which I belonged. I continue to train in my Taekwon-Do and always try to learn. I believe there is so much more for me to learn both technically and philosophically. When attending the Leadership Camp and International Workshop on teaching of the Do in Spain during 2006, I realised the ITF has a good plan in place to promote the philosophical aspects of Taekwon-Do. Many other workshops and courses I have attended since then have reinforced this view. I always look forward to understanding and teaching these aspects. 1979: Commenced training Taekwon-Do in the Greystones School of Taekwon-Do with Instructor Mr. R. Wheatley II Degree Black Belt. 1983: Assumed the role of co-instructor at Greystones School of Taekwon-Do. 1983: Completed All Ireland Taekwon-Do Association Instructor Course in Cork. 1985: Assumed the role of instructor at Greystones School of Taekwon-Do. 1986: Completed CQB (self-defense) Courses with Mr Brian McCarthy, Ninjitsu Master. Awarded 1st level of Competence. 1989: Completed National Coach Award – NVQ 3 with Mr A Gummerson, Sports Psychologist for the British Olympic Team. 1993: Completed the All Ireland Taekwon-Do Association Instructor Course (including First Aid course) with Mr. Aidan Walsh, V Degree Black Belt and Chief Instructor of the AITA, and Mr Henk Meyer, VI Degree Black Belt. 1995: Qualified as an International Taekwon-Do Federation International Instructor (certificate number 844). 1995: Qualified as an International Taekwon-Do Federation International Umpire (certificate number 661). 1996: Completed one day ITF technical seminar with Master Howard VII Black Belt and Master Anthony Phelan VII Black Belt. 1996: Completed Umpire and Referee course hosted by Master Howard VII Black Belt and Master Phelan VII Black Belt (certificate number 96-215). 1996: Completed national technical seminar with Master Robert Howard VII Black Belt and Master Anthony Phelan VII Black Belt (certificate number IRL-033). 1996: Completed Instructor seminar with Master Robert Howard VII Black Belt and Master Anthony Phelan VII Black Belt (certificate number NGB-020). 1997: Completed Instructor seminar with Master Robert Howard VII Black Belt and Master Anthony Phelan VII Black Belt (certificate number NGB-125). 1999: Hosted and completed in conjunction with the Executive of the AITA, International Instructor Course at Trinity College Dublin, with General Choi Hong Hi, President and founding father of Taekwon-Do, Master Choi Jung Hwa VIII Degree Black Belt and Master Tom Mc Callum VIII degree black belt and Secretary General to ITF. 2001: Completed Umpire and Referee Course hosted by Master Howard VII Degree Black Belt and Master Phelan VII Degree Black Belt (certificate number IRL-20-01). 2002: Completed Umpire and Referee course hosted by Master Howard VIII Degree Black Belt and Master Phelan VII Degree Black Belt (certificate number IRE-013-02). 2004: Completed National Umpire Course with AITA Umpire Chairperson (certificate number J-01-05). 2005: Completed Level Three Coaching Course in Martial Arts as part of the National Coaching Development Program hosted by the Irish Martial Arts Commission (Motivation in Sports Psychology, Nutrition, Long-Term Athlete Development and Youth Protection in Sport). 2006: Completed International Umpire Course with Master Wim Bos VIII and Umpire Chairperson of ITF. Budapest, Hungary (certificate number 2-21). 2006: Completed 1st International Workshop on Teaching of the Do (Self Control- Level 1) with Master Trân Triêu Quân VIII and President of ITF, Professor/Dr. Janel Gauthier III Degree Black Belt, Master Kim Lan Ung VIII Degree Black Belt Ms Joliette Tran VII Degree Black Belt (certificate number 01-011). 2006: Completed 2nd International Taekwon-Do Federation Leadership training camp with Master Trân Triêu Quân VIII and President of ITF (certificate number ITF-LC002/010). 2006: Completed Umpire and Training Seminar, Dublin, Ireland, with Master Wim Bos VIII and Umpire Chairperson of ITF. 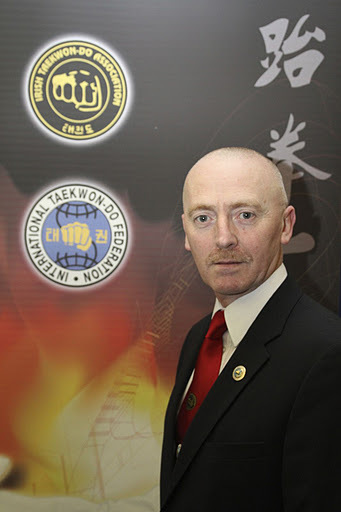 2007: Joined the Executive of the Taekwon-Do Advisory Board to the Irish Martial Arts Commission, the government-recognised commission for all martial arts in Ireland. 2007: Became a member of the Executive of the Irish Martial Arts Commission. 2008: Became a Director of the Irish Martial Arts Commission. 2008: Completed Child Protection in Sport Awareness Workshop as hosted by the Irish Martial Arts Commission in conjunction with the National Sports Council. 2009: Completed National Umpire Course with ITA Umpire Chairperson. National Umpire Class A. 2009: Completed the Level Three Irish Martial Arts Commission Continued Education Program. 2010: Completed Level Three Coaching Course in Martial Arts as part of the National Coaching Development Program hosted by the Irish Martial Arts Commission. 2010: Completed the ITA Umpire Training Course, National Umpire A Class. 2016: Completed Level Three Coaching Course in Martial Arts as part of the National Coaching Development Program hosted by the Irish Martial Arts Commission. 2016: Completed International Instructor Course with Grand Master Hector Marano IX and Chairman of Technical and Instruction Committee of ITF, Grand Master Paul Wiler Senior Vice President of ITF and Grand Master Ung Lam IV, Warsaw, Poland. May 2016. 1989: Taekwon-Do Association of Ireland Championships: 2nd Place in Black Belt Pattern. 1991: AITA South-Eastern Championships: 1st Place Black Belt Special Technique Power Test. 1992: AITA National Championships: 3rd Place Black Belt Pattern. 1993: AITA National Championships: 2nd Place Black Belt Pattern. 1994: AITA South Eastern Championships: 2nd Place Black Belt Pattern. 1st Place Black Belt (male) Power Test. 1994: TAI “Best of the Best” Championships: 1st Place Belt Pattern Grand Champion Taekwon-Do Pattern. 1994: AITA National Championships: 1st Place Black Belt (male) Power Test. 2nd Place Black Belt Pattern. 1994: TAI “Best of the Best” Championships II: 3rd Place Black Belt Pattern. 1995: AITA South Eastern Championships: 1st Place Black Belt (male) Power Test. 1996 I joined Greystones School of Taekwon-Do . 2000 I was promoted to 1st Degree in Templemore Garda training Academy under the ITA Examiners Board. 2002 I was promoted to 2nd Degree in in Wexford under the ITA Examiners Board. 2004 I was promoted to 3rd Degree in Greystones under the ITA Examiners Board. 2007 I was promoted to 4th Degree in Belgium under GM Hector Marano GM Pablo Trajtenberg and GM William Jacob Bos. 2011 I was promoted to 5th Degree under ITA Examiners Board. 2016 I was promoted to 6th Degree in Dublin under GM William Jacob Bos and GM Ung Kim Lan.. In 2014 I qualified as a National Umpire A Grade. In 2016 I qualified as an International Umpire A Grade. My fondest memory to date in Taekwon-Do is to have been lucky enough to train with the Founding Father of Taekwon-Do, General Choi Hong Hi, in Trinity Collage Dublin in 1999.